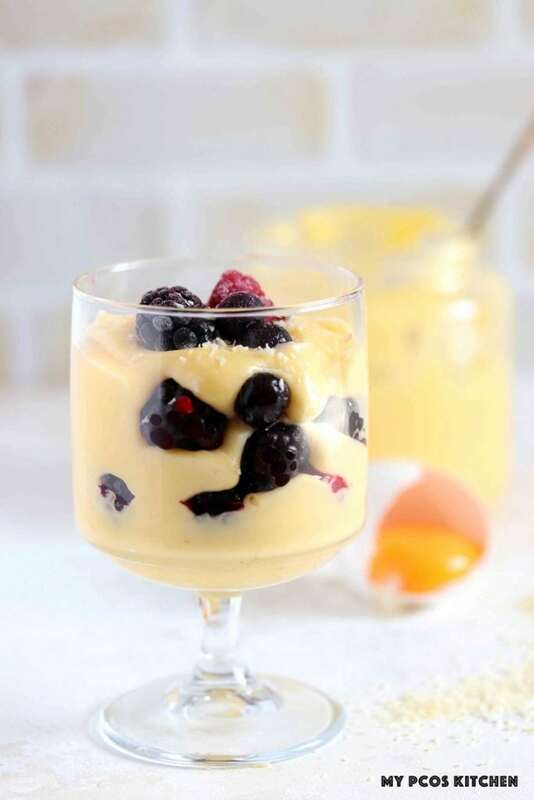 This delicious vanilla pastry cream is completely sugar free which makes it the perfect low carb pastry cream that can be used in any dessert. 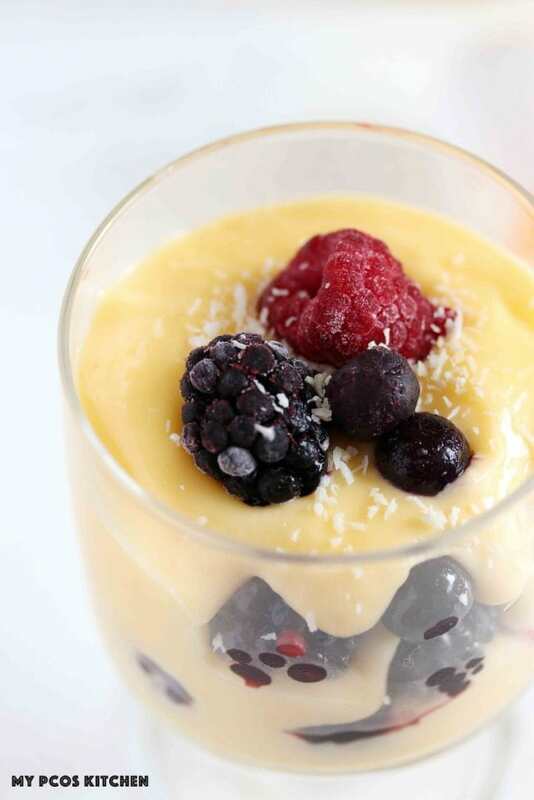 I give the option for a dairy free option as well made with coconut milk for those following a dairy free diet. Pastry cream, or Crème pâtissière in French, is a key ingredient in many French desserts and can be used in a variety of ways. 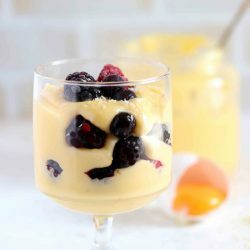 It’s a thick custard that can be used as a filling in cakes, tarts or pastries. 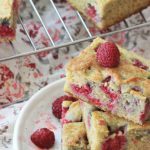 My favourite low carb way to eat it is spreading it over cakes, in parfaits or filling fruit tarts with it! It’s usually made with a combination of milk, eggs, sugar, starch or flour and some kind of flavouring. The flavours can include vanilla, lemon, chocolate, or extracts and liqueurs. 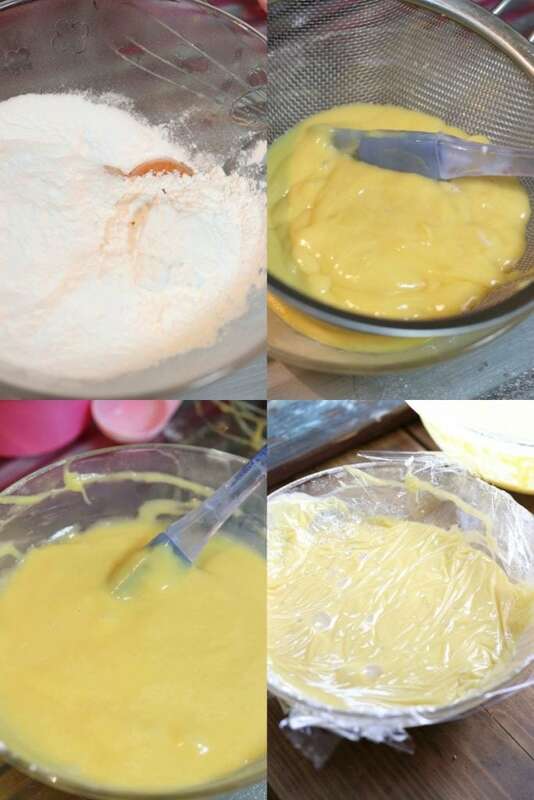 The use of cornstarch sets the pastry cream apart from a custard because it gives it a very thick consistency that makes it extremely versatile to other custard sauces. For a low carb version, I switched the traditional cornstarch for arrowroot powder. Tapioca starch could also be used, but is slightly higher in carbs. 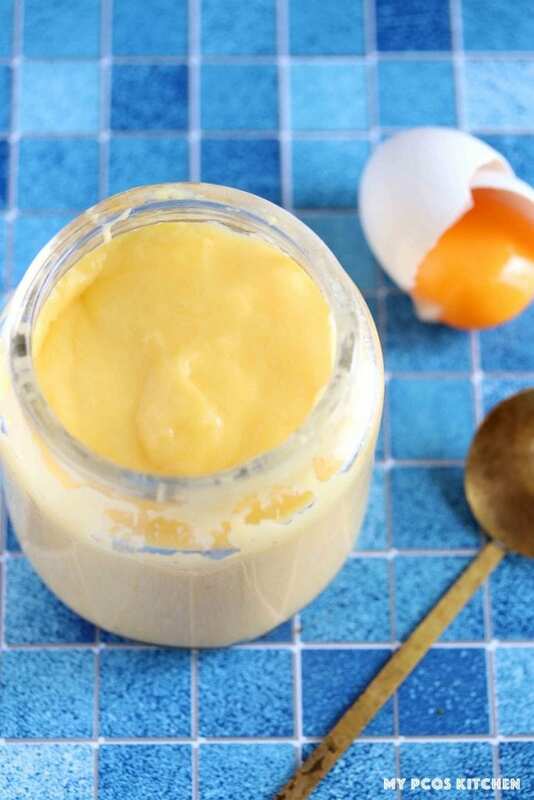 Making low carb pastry cream is a bit challenging as you absolutely will need to use some sort of starch in this French pastry cream recipe. 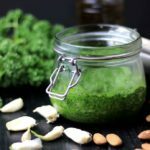 It is pretty common to use xanthan gum or guar gum to thicken sauces in the low carb world, like for gravy or for cheese fondue, but it unfortunately doesn’t work quite as well here. 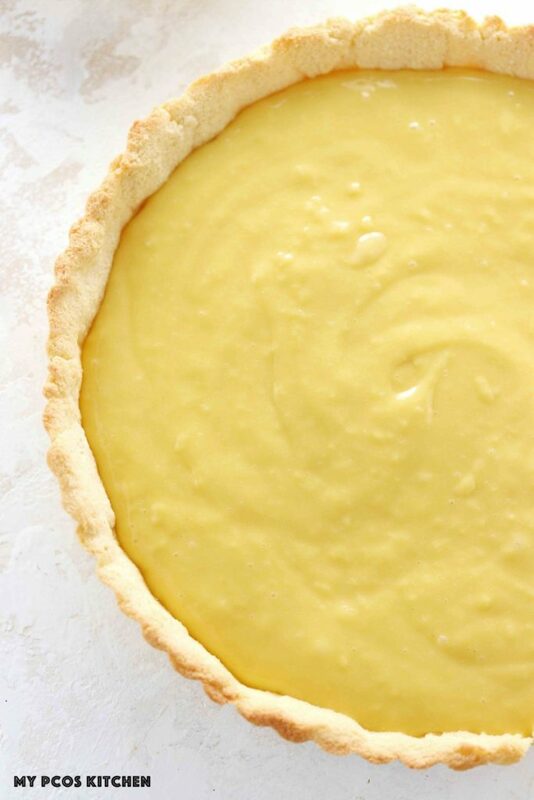 Using xanthan gum or guar gum in a low carb pastry cream will result in a slimy and gooey mess of a custard that is not very palatable. I don’t mind sacrificing some carbs if it means that I’ll be able to enjoy the recipe even more. Plus arrowroot and tapioca are on my approved PCOS food list that I follow. Making vanilla pastry cream is quite easy to make as you’ll only need a handful of ingredients. Thankfully, the ingredients required for this pastry cream are very similar to the sugar-filled one as you’ll only need a couple of substitutions. Instead of milk, I used heavy cream to cut back on the sugar, but you could also use a combination of almond milk and heavy cream if you wished to cut out some of the calories. Personally, I think that heavy cream tastes better in terms of texture as it ends up more creamy than the almond milk. Instead of the sugar, I used powdered erythritol and it was more than sweet enough that I didn’t need to add any extra stevia or monk fruit powder. 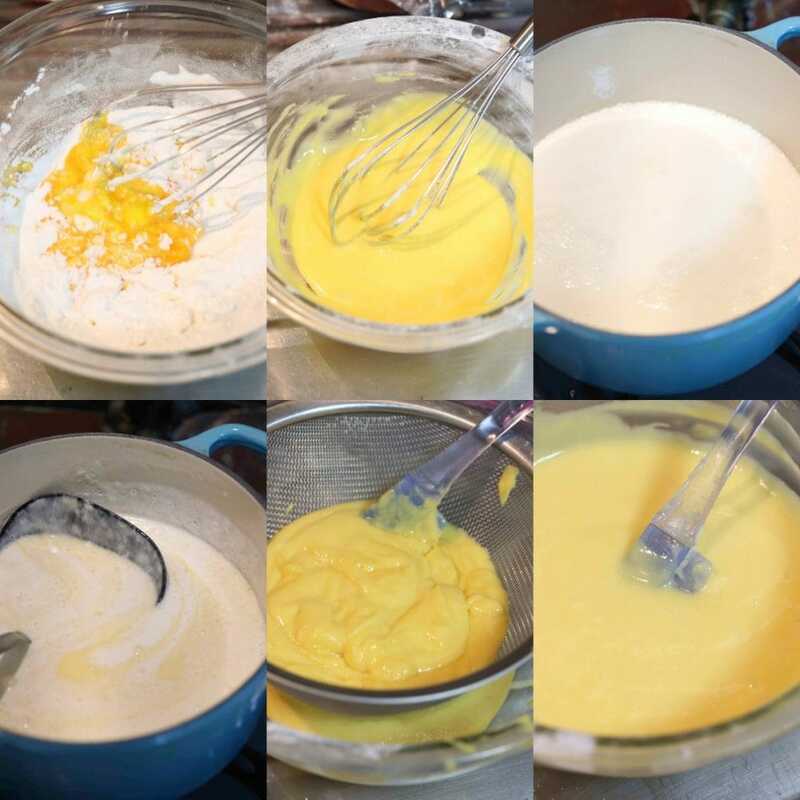 The first step to making a pastry cream is to mix some egg yolks with the erythritol and the arrowroot powder. You’ll end up with a light and creamy yellow cream. In a small pot, heat the heavy cream just until it starts to bubble. Once it does, turn off the heat immediately. Take a ladle and add one cup full of hot milk into the egg yolk mixture and mix together. This will slowly tamper the eggs so that they don’t curdle once fully added to the hot cream. Once you’ve mixed the cup of hot cream into the eggs, you can then pour the rest of the mixture into the cream and turn the heat back on. You can add the vanilla into the hot cream now. 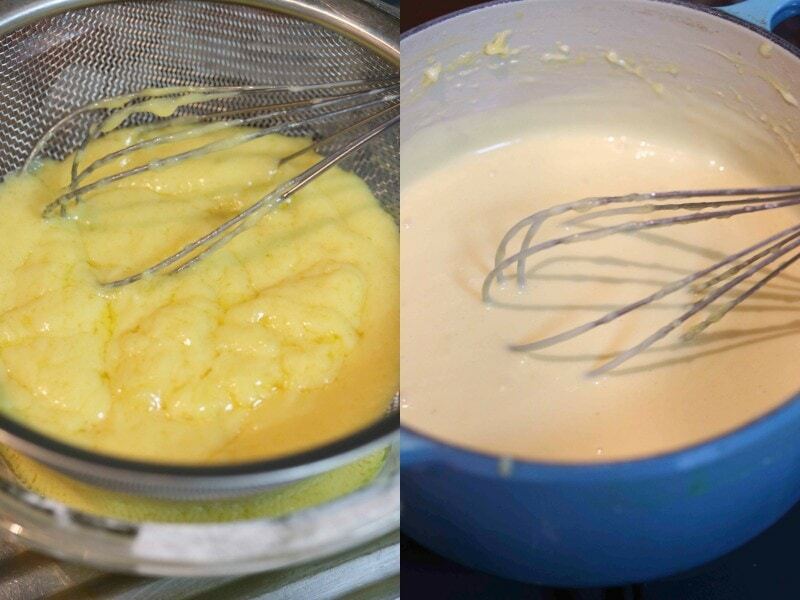 You’ll heat the pastry cream on low heat and whisk continuously until the custard has thickened. Once thickened, you’ll need to pass it through a sieve to get rid of all of lumps and it should end up all nice and smooth! Let it cool down a bit, cover it with saran wrap and then put it into the fridge to cool down completely. What Sweeteners to Use in a Sugar Free Pastry Cream? I highly recommend using low carb powdered sweeteners when making a sugar free pastry cream. The reason why I don’t recommend granulated kinds is because they have a harder time melting and once the recipe is done and cooled, it will have a grainy texture to it. You can take granulated sweeteners, pop them into a strong blender, and mix until it becomes a fine powder. That’s what I do personally for any low carb granulated sweetener and it always does the trick. I recommend using a bulky low carb sweetener and not one like stevia or monk fruit powder because you need that extra bulk to replace the sugar with. By using stevia or monk fruit, you are more likely to end up with scrambled eggs than a french pastry cream recipe. I have personally used powdered erythritol, the store-bought kind and homemade one, and a granulated golden lakanto mix that I had pulverized into powder in my blender. Both worked extremely well. You could also use xylitol and powder it, just make sure you don’t have dogs around as it’s deadly to them. My low carb vanilla pastry cream recipe uses heavy cream instead of milk to cut back on some of the carbs from the sugar in milk, but for a dairy free version, you can switch the heavy cream for coconut milk. I used canned coconut milk from Thai Kitchen to make this recipe and it turned out quite nice! You could also use a combination of almond milk and coconut milk if you’d like your dairy free pastry cream to have less calories and carbs. 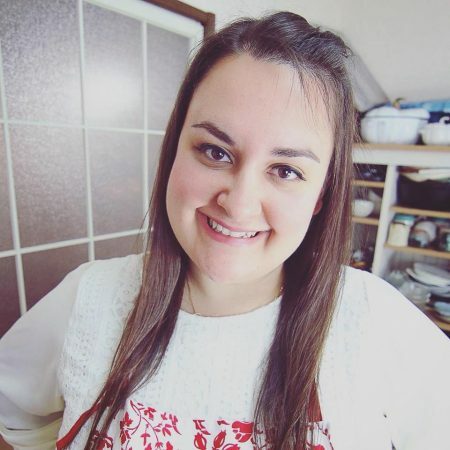 I personally preferred making my dairy free pastry cream with coconut milk as it turned out extremely smooth and creamy, just the way I like it. You can use your pastry cream and pour it on different desserts. I poured mine over my almond flour pie crust and made a delicious and easy dessert that way! Making a coconut pastry cream is just like making a dairy filled one. The only difference is that you’ll need to switch the heavy cream for coconut milk. Apart from that, all of the steps are the same. You’ll need to sieve it as well and let it cool down before placing it in the fridge to cool down completely. A broken pastry cream usually happens when the eggs are overcooked and they start to either scramble or the pastry cream becomes lumpy. To fix a broken pastry cream, use these following tricks to make sure you get a nice and smooth pastry cream. Always make sure to cook your pastry cream on low heat. If you use high heat, your eggs will either scramble, or the fat and milk solids will separate. Whisking continuously is the key. Do not stop whisking as you may cook the eggs at the bottom of the pan. Don’t substitute the arrowroot powder for xanthan or guar gum. It will somewhat work out, but your French pastry cream will end up looking like goo or slime, so it’s not quite nice to the palate. You can substitute the arrowroot for tapioca, or any other starch if you eat them (potato starch, corn starch). If your pastry cream becomes lumpy, usually because you’ve heated too much like in the picture below, immediately take it out of the pot, into a bowl and whisk for 20-30 seconds with an immersion blender. You can also pour the lumpy pastry cream into a blender and blend for 30 seconds. The fast speed of the blades will make the lumps creamy again as you can see in the picture below! This was done with my Blendtec. If the fat and milk solids separate, you could try the following trick, but it doesn’t always work. Add an extra egg yolk to a cold bowl and a table spoon of water. Whisk that together and slowly pour in the broken pastry cream while whisking continuously. After you’ve added all of the broken pastry cream back to the bowl, you should have a nice and smooth cream again. Hi Roberta, I mention this in the blog post in details. 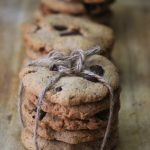 Xanthan gum and guar gum will not work for this recipe as you really do need the starches for it to work. You can use it and it will thicken it, but it will end up like slime, so not very palatable. Wow girl! This looks AMAZING! and so easy! Thank you so much!